Choji Akimichi is a long-time friend of Shikamaru Nara. When his peers would refuse to play with Choji because of his size, Shikamaru would stick up for him and spend time with him instead of the others. Because of Shikamaru's willingness to overlook Choji's deficiencies and appreciate his true strength, Choji came to view Shikamaru as his best friend who he would do anything for. Choji is characterized by his love for food, an annoyance for his teammates as satiating himself often comes before other necessities such as stealth and teamwork. Despite his eating habits Choji is very sensitive about his size and becomes highly agitated when somebody calls him "fat". 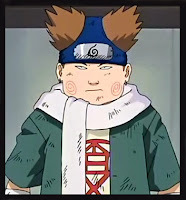 Once called "fat," Choji's resolve to fight is elevated to new levels and he becomes much more hostile to his opponents. Though he looks more muscular than obese in Part II, he is still apparently sensitive about his size, and others make it a point to avoid using the word "fat" around him. As an Akimichi, Choji's style of combat focuses on increasing his size. At the series' start he uses the Multi-Size Technique to serve this purpose, reshaping him into a large, round form. Once in this form he can use Human Bullet Tank to tuck his limbs inside his increased mass and roll at opponents at rapid speeds. Choji sees a number of advancements in Part II; the Multi-Size Technique, while still increasing his size, no longer makes him round. This more manageable form gives him better maneuverability, as he can now fight as he normally would only with the added bonus of his increased size. Choji also gains the ability to increase portions of his body at will, gaining such advantages as larger, stronger arms without taking on gigantic proportions. choji is amazing. how did he get the chakra wings in shippuden without eating the deadly chili pill?